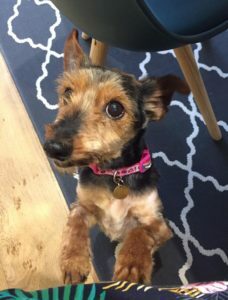 Little Peggy is a fab little Yorkie cross around 6 yrs old with tons of character and zest for life! She came to us in one of the worst states we’ve ever seen, she was horrendously matted and had to be shaved to get all her mats out, even worse were her teeth which were all infected and rotten. She now has only 7 teeth left, but is feeling soooo much better and has been a total superstar throughout her ordeal. Peggy is a really happy little lady who loves people so much, she loves her walks and loves a fuss! She is good in the house and is housetrained and OK to be left for a few hours, but would love a home where she gets lots of company. She’d be happiest as the only pet so she can be centre of attention. Peggy hasn’t been assessed around children, and would suit a home with children 12+. She will need a secure garden as she’s a typical little Terrier who will find an escape route!